Working at National Museums Scotland, no one day is the same. As part of my job as National Partnerships Officer I co-ordinate our Knowledge Exchange Programme. Through these training courses I get the opportunity to meet and work with some great people from museums all over Scotland, while at the same time learning lots about areas of museum practice – both things that I love! 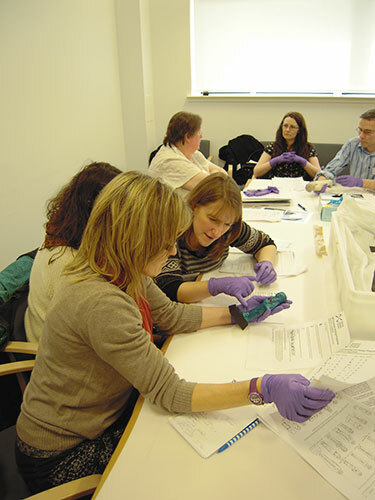 Earlier this year, I worked with Margaret Maitland, Curator of the Ancient Mediterranean at National Museums Scotland, to put together and deliver a course to introduce our Egyptology collections and share knowledge on the care and identifications of Shabtis. As a child I loved reading about Ancient Egypt and its customs so I was particularly excited about the opportunity to arrange and attend the course and learn lots from Margaret. “What are shabtis? !” I hear you ask! I thought the exact same thing when Margaret suggested them as a topic for the day. It turns out that they are small funerary figures used in Ancient Egypt, and they made for a fascinating knowledge exchange workshop. 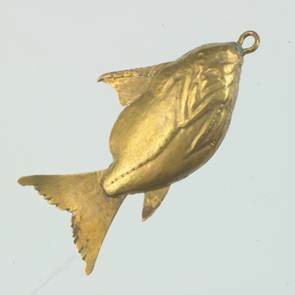 They are charming and stylistically complex objects which feature in a number of Scottish museums’ collections. Some information and images of shabtis in National Museum Scotland’s collections can be found here. Curator Margaret Maitland showing some of the group objects in store. 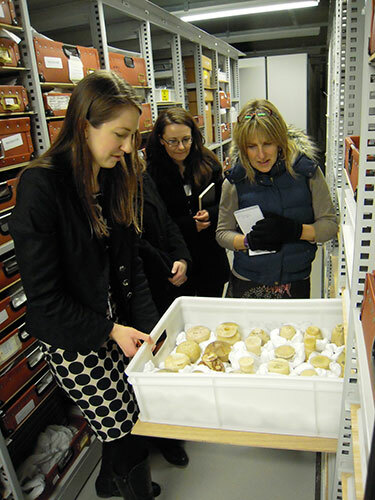 The event kicked off down at the National Museums Collections Centre – our storage facility in Granton – with Margaret giving the group a tour of the Egyptology collections that are in store. This was a great opportunity for me to get behind the scenes and see some fab objects that I normally wouldn’t have access to. We were treated to seeing some beautiful carvings and sarcophagi, as well as a lot of funerary material and – of course – some shabtis! Margaret led us through the evolution of shabtis, their purpose, and stylistic and conceptual development. 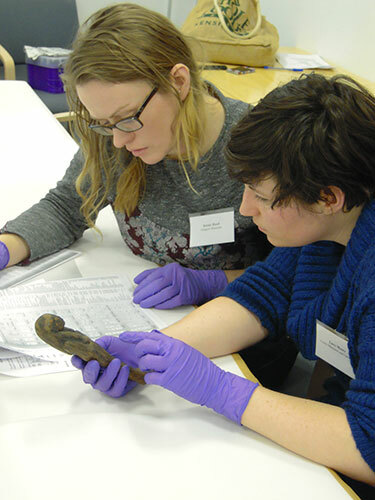 Then came the fun part – getting our hands on some actual shabtis! Prior to the group arriving, we had got some beautiful examples of shabtis out of their store and brought them down to the room. The group were kitted out with gloves and we dressed the table to make it suitable for handling. We split up into small groups and had a go at applying the skills we had developed in the morning to see if we could identify the figurines and read some inscriptions. 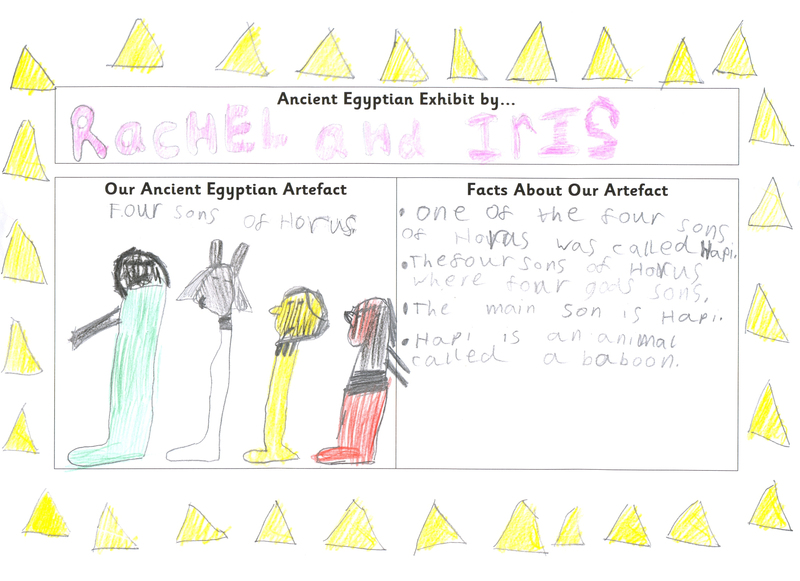 Reading hieroglyphics – Lucy (on the right) turned out to be natural! Trying to identify characteristics on the figurines proved to be quite tricky! We had a lot of fun trying to identify characteristics and inscriptions on the great range of shabtis that Margaret selected. Even a novice like me was able to identify the odd hieroglyphic! Attendees to the workshop brought along with them photos of shabtis from their own collections and Margaret and the group had a go at identifying them too. The day was a great success – the group found lots of common ground in their Egyptology collections and we discussed the possibility of a project together in the future. Margaret and I are now putting together a workshop for later in the year to further develop the group’s skills in reading hieroglyphics. For me, a particular highlight was getting to handle the shabtis and have a go at the identification. 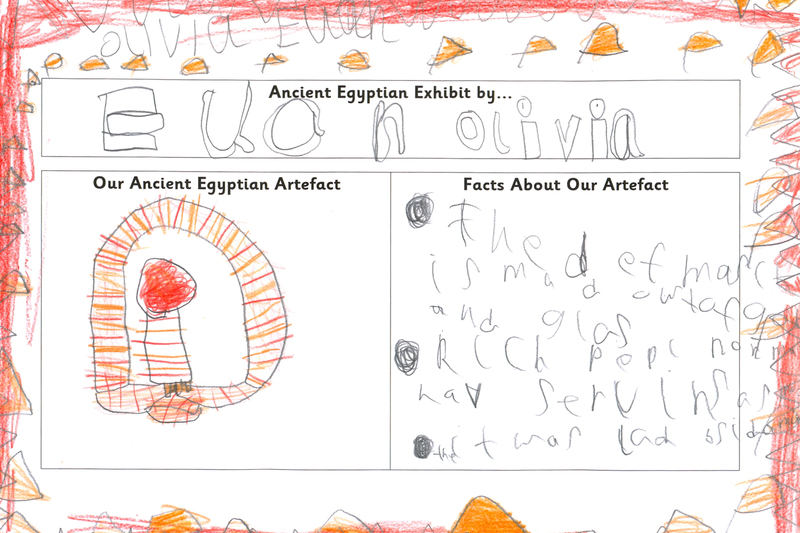 I am already looking forward to attending the next course and seeing if my childhood attempts at hieroglyph reading were any good – though something tells me I won’t be giving up my day job just yet! 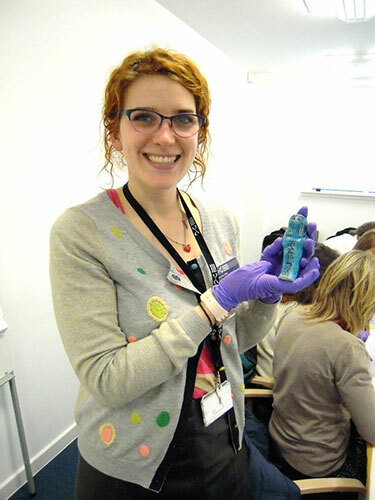 Me, looking very excited to be holding a shabti! I recently visited the National Museums Collection Centre to study a rather remarkable artifact: a casing stone from a pyramid of Giza. The casing stones have a sloped, triangular face and formed the outer surfaces of the pyramids, as opposed to the inner blocks, which were left roughly hewn and were approximately cuboid. This stone was mined at the quarries in Tura on the east bank of the Nile 45 centuries ago, transported to Giza on the west bank, then carefully shaped with copper tools and placed in position on the outside of one of the Old Kingdom pyramids. 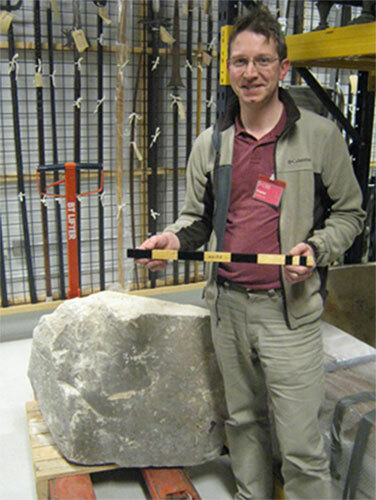 David Lightbody with the pyramid casing stone (A.1955.176) and his replica Egyptian cubit measuring rod. The original architectural position of this particular block remains a bit of a mystery as it was found in the mounds of debris on the north side Great Pyramid of Khufu by Waynman Dixon in 1872. Dixon was an English engineer who was carrying out investigative work at Giza for the Astronomer Royal for Scotland, Charles Piazzi Smyth. Smyth was interested in the dimensions of the Great Pyramid and the stone was brought back to Edinburgh for him. Using the slope of the face of a casing stone, it is possible to calculate the side slope of all of the pyramid’s faces. 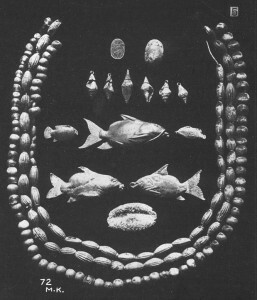 Artefacts from Giza brought back by Waynman Dixon in 1872 including the Edinburgh casing stone. A full understanding of the dimensions of the pyramids and how they were established only came later, in part due to another discovery made by a Scottish archaeologist, Alexander Henry Rhind. The Rhind Mathematical Papyrus, now in the British Museum, contains many examples of arithmetical and geometric problems, including how to calculate the slope face of a pyramid. The ancient Egyptian methodology for defining a slope face began with the architects choosing the desired base and height dimensions for the pyramid, measured in Egyptian standard cubits. 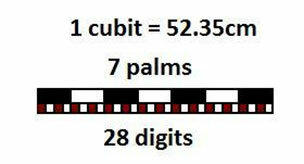 1 cubit was a standard measurement length used all over ancient Egypt for measuring fields and constructing buildings. It was 52.35 cm long during the Old Kingdom when these pyramids were built, and this was broken down into 7 ‘palms’ of 4 ‘digits’ each. Using straightforward arithmetic, the Rhind papyrus shows us how the side slope of the pyramid faces could be calculated from the chosen pyramid height and side length, and defined numerically by working out its ‘seked’. This seked is the name the Egyptians used for their slope system. It is a little like modern day degrees and angles, or inclines quoted in percents like we see on road signs for steep hills. According to the Rhind papyrus, the seked slope consisted of the number of palms moved across horizontally for each 1 cubit rise. Pyramid seked calculation – Problem 56 of the Rhind Papyrus. In order to understand the pyramids and this casing stone in Edinburgh then, we need to approach their study using these ancient Egyptian measurement systems. The block is only partially preserved, but the three all-important worked faces—the base, top, and sloped face—are mostly intact. Only a portion of the base survives though, so the block sits on its side, meaning I could not use an inclinometer to measure the slope. 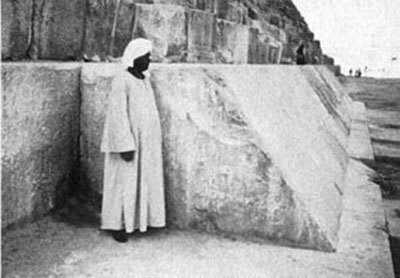 Nevertheless, tools can be used in different ways, and by placing the flat edge of a laser spirit level against the top face of the stone and holding an inclinometer’s pendulum at the known angle of the Great Pyramid against the stone’s face, it confirmed the correct angle known for the Great Pyramid of 51.84 degrees. Note that the accuracy of this measurement is only around 1 degree at best, and so it was carried out only to verify the known data rather than to establish new data. Measuring the angle of the casing stone slope. After this was done, I brought out replica ancient Egyptian cubits rods. On one of them I had already marked off 5 1/2 palms, which is the known seked of the Great Pyramid. When used with another cubit, the two formed a triangle with a seked slope face of 5 1/2. By placing the marked cubit against the top surface I could then use the second cubit as a vertical to check the size of the slope using the cubits. In this case the second cubit should touch the face surface at some point allowing a measurement. The erosion of the lower corner of the block had rounded off that edge, so I placed a flat plank against the bottom of the stone. I was surprised to see that the darker cubit rod fit exactly between the upper white cubit and the plank, indicating that the casing stone was exactly 1 cubit thick. Measuring the block faces with replica cubit rods. Pyramid angle of casing stone block using cubit and seked system – Seked of 5 1/2. Smyth thought that this was deliberate, but he drew a series of unfounded conclusions about the significance of this geometric relationship. The great Egyptologist Flinders Petrie followed Smyth’s work with a more scientific study and detailed triangulation survey of the whole Giza Plateau in 1882. Circular proportions of the Great Pyramid of Khufu at Giza. Petrie was certain that the circular symbolism had been intentional and wrote “…these relations of areas and of circular ratio are so systematic that we should grant that they were in the builder’s design”. He also found the same proportions and related numerical dimensions used in the construction of the king’s burial chamber in the Great Pyramid, and in other pyramids as well. My own contribution to this subject was to check all of the data again, and try and identify what this symbolic architectural choice meant to the ancient Egyptians within their own cultural systems of thought. The special proportions were likely a manifestation of a deep-seated belief in the power of encircling protective symbolism. 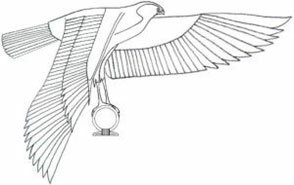 The most notable expression of this concept is the shen ring, which was often shown carried above the pharaoh by the royal patron god Horus, the falcon, from as early as the Third Dynasty. Typical arrangement of the royal god Horus with shen ring often seen flying above the pharaoh. 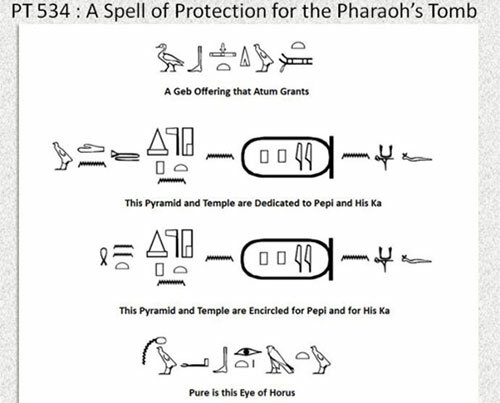 Spell of protection for the pharaoh’s tomb. This spell or prayer of protection is written on the walls of the entrance passage into the pyramid of Pepi I at south Saqqara and may describe the rituals involved with building this monument. The text starts with a ‘Geb offering’, which may allude to a foundation deposit made at the start of the construction as Geb is the god of the earth. This is followed by lines describing how the pyramid and temple are then ‘established’ and then ‘encircled’ to make them pure; an ‘eye of Horus’. The encircling here, using the word shen, implies that the pyramid is also protected by this action. Surviving casing stones on the Great Pyramid of Giza. One final mystery remains, however. Heavy though this casing stone is, it is small compared to the giant sloped stones still in place along the northern side of the base of the Great Pyramid. It is possible the Edinburgh block might come from one of the similarly proportioned Queens’ pyramids, built at the same time as the Great Pyramid, but with smaller casing blocks. However, it might more likely come from the upper levels of the Great Pyramid, near the peak. 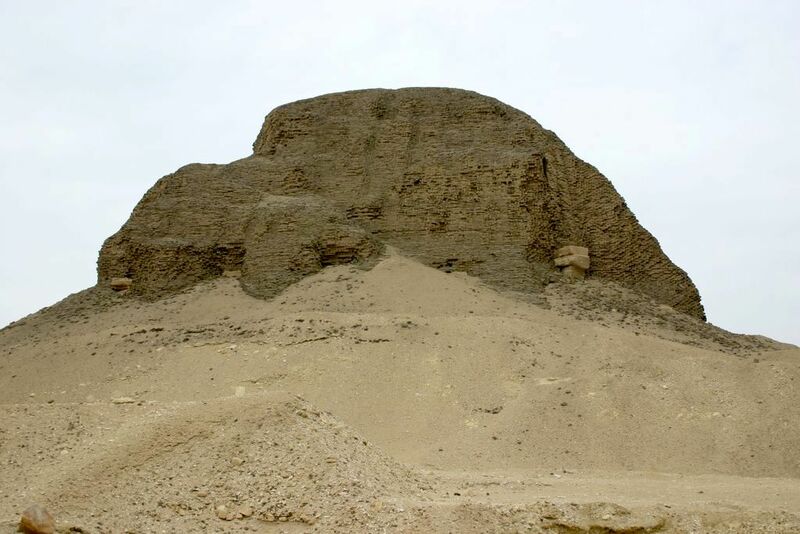 As Mark Lehner described for the second pyramid of Khafre, which still has some casing stones in place, ‘the casing stones at the top of the pyramid are much smaller – about 1 cubit thick (c. 50cm/20 in)’. The Edinburgh casing stone, therefore, is most likely to be a rare survival from the summit of Khufu’s extraordinary pyramid, 146 meters high when completed. This stone, however, is not ‘approximately’ 1 cubit tall, it seems to be precisely 1 cubit tall. This level of precision would fit with what we know of the Great Pyramid, for which the standards of workmanship and consistency were greater than for many, if not all, of the later pyramids. 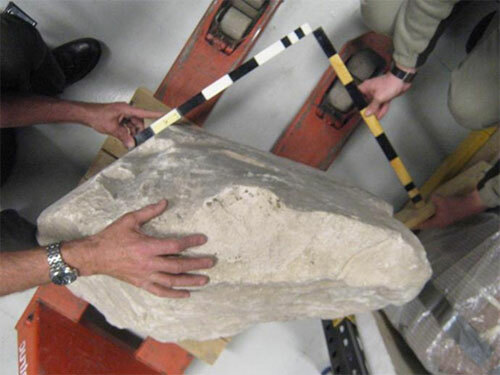 This unadorned block of broken stone has remarkable historical and scientific significance, both regarding the ancient world and the 19th century world, and continues to reveal new information. 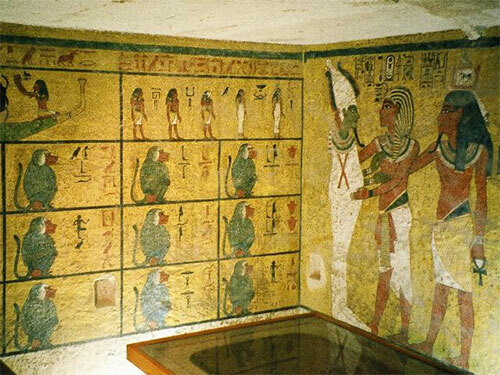 The tomb of Tutankhamun. Photo taken by Hajor, Dec.2002. Released under cc.by.sa and/or GFDL. That day transformed our knowledge of ancient Egypt forever. Despite being a hastily arranged burial for a relatively minor king who died in his teens, the contents of the tomb – over six hundred objects, ranging from thrones and chariots to game boards and underwear – was one of the greatest archaeological finds of all time, an unparalleled time capsule from 14th century BC Egypt. The discovery of Tutankhamun’s tomb fuelled many Egyptologists’ early interest in the subject, including one of our former curators, Cyril Aldred, a notable Egyptologist who served from 1937–1974. While still at school, he met Howard Carter, who tested him on his Egyptological knowledge and was sufficiently impressed to introduce him to the great Egyptologist Sir Flinders Petrie. Carter urged Petrie to take the young man on excavation with him, but Aldred was deterred when Petrie requested that his father contribute to financing the excavation! Despite this initial set back, Aldred had a long and influential career in Edinburgh. Knowing how famous Tutankhamun is today, it is hard to believe that a hundred years ago he was almost completely unknown, even to Egyptologists. 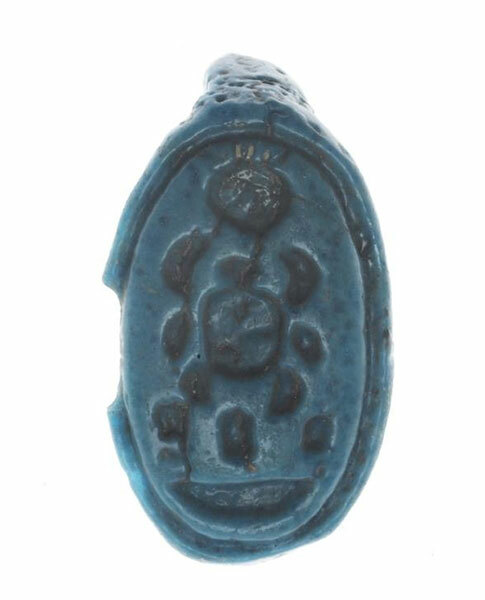 Very few occurrences of his name had been found before the discovery of his tomb, but it is possible that an object in our collection may have been amongst the very earliest – a bright blue bezel finger ring stamped with the throne name of Tutankhamun. It is known to have been in the collection of the National Museum of Antiquities in 1900 (the National Museum of Antiquities later merged with the Royal Scottish Museum, to form what is now National Museums Scotland). 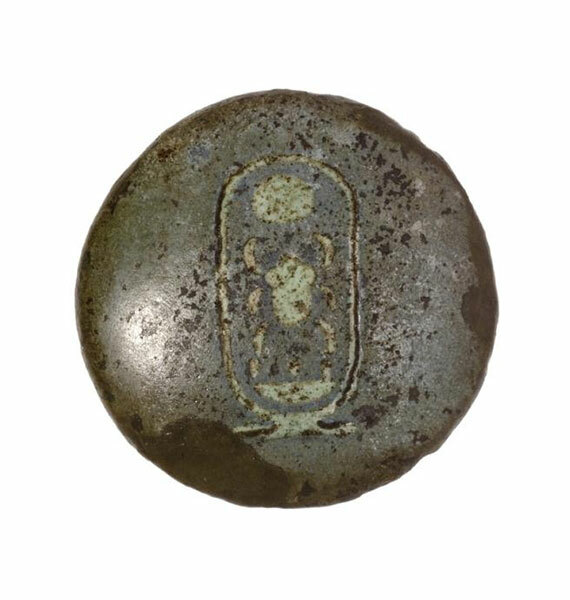 This suggests that it was amongst the objects brought back from Egypt in the 1850s by the Scottish antiquarian and early archaeology pioneer Alexander Henry Rhind. Rings like this are thought to have been produced because the divine nature of the king’s name held magical, protective qualities. Bright blue bezel finger ring stamped with the throne name of Tutankhamun, on display in the Ancient Egypt gallery at National Museum of Scotland. Faience handle from a wooden box, decorated with Tutankhamun’s throne name, on display in the Ancient Egypt gallery at National Museum of Scotland. In addition to these small finds, the museum also holds two somewhat mysterious statue heads, which certainly date roughly to the era of Tutankhamun, but over which scholars have debated for decades. Cyril Aldred wrote that he and Bernard V. Bothmer of the Brooklyn Museum had argued over the head ‘for years without reaching finality’. 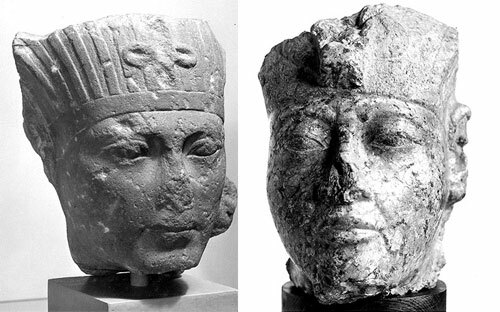 Granite heads that may represent Tutankhamun, on display in the Ancient Egypt gallery at National Museum of Scotland. Their hooded eyes and deep furrows from the nose to the downturned mouth are strongly reminiscent of late Amarna art and I can certainly see the resemblance to other statues identified as Tutankhamun. Further research is required, but it is important to remember that royal statues were never intended as portraits and were executed by different artists, so definitive attribution is unlikely. Many scholars have had different opinions on who our mystery pharaohs are – what do you think? It’s not every day that you get the chance to build a gigantic pyramid in the National Museum of Scotland! Running alongside the Fascinating Mummies exhibition, we are going to pull a crack team of pyramid builders together to recreate some of the monument building traditions of the Egyptian past. This project will give a wider audience of visitors the opportunity to experience the secrets of Egyptian pyramid building. I am an Archaeologist and Egyptology Tutor at the University of Glasgow, and I am also an engineer, so I know a lot about the techniques used by the Ancient Egyptians to build their massive pyramid tombs. In 2008 I published a book about this, and I have been researching their methods for more than 10 years, so I am thrilled to be given the opportunity to do this. 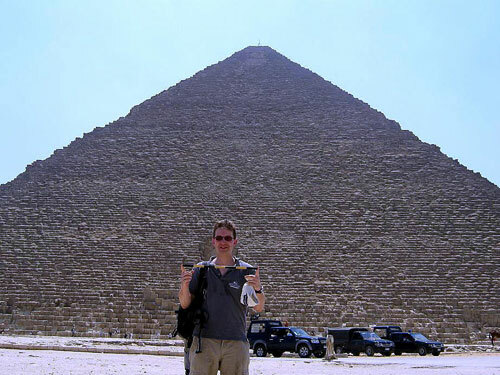 David in front of the Great Pyramid at Giza. First we will recreate some of the purification and dedication rituals that made the land where the pharaoh’s tomb was to be built sacred. Then the architects will carefully set out the ground plan, to just the right size, and with all the sides pointing in the right directions, to the north, south, east and west. When this is complete we will assemble the teams of workers in place. Which team will you be on? Do you want to join ‘The Friends of Khufu’, or the ‘Drunkards of Menkaure’? These are the real names of the teams that built the pyramids of Giza. Big kids and little alike can also leave an offering for the pharaoh. We will show you how to write some of the most important hieroglyphs, the names of the pharaoh himself, and how to tell him what you will give him for the afterlife. It’s meant to be fun, but the construction work will have to be accurately carried out to ensure that the pharaoh’s tomb looks just right once it is finished. When complete, we will dedicate the tomb to the pharaoh and ‘activate it’, so that it can protect his body and successfully send his spirit to the afterlife. Some of the trainee teachers from the University of Glasgow Department of Education have kindly volunteered to come and help build the pyramid. 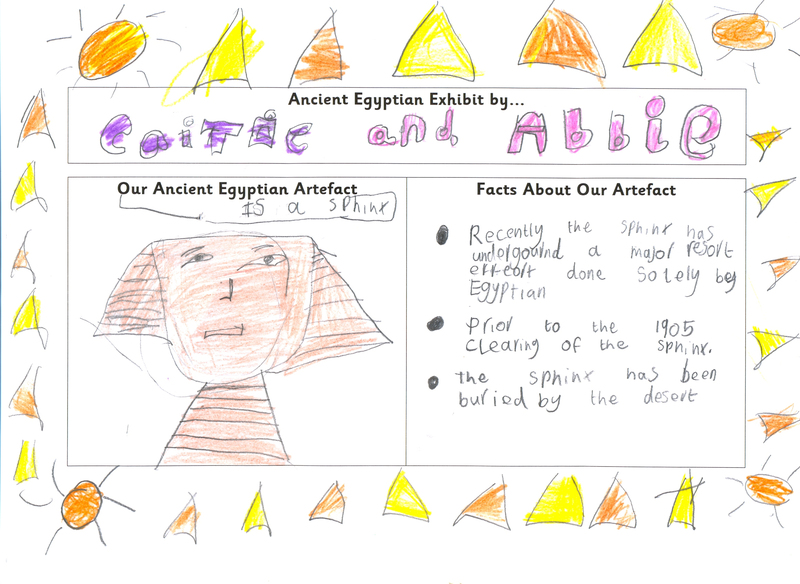 They are currently studying the history of Ancient Egypt so that they can teach the next generation about it in Scotland’s primary schools. They are going to help visitors to participate in this once-in-a-lifetime chance to build a giant pyramid, albeit one made of cardboard boxes. We will need to work quickly as we only have the weekend (the original Great Pyramid took 30 years to build! ), but thankfully we won’t need to drag blocks of limestone across the floor of the Museum. We will need around 100 large cardboard blocks to complete the giant pyramid, and each one will have to be carefully assembled on the day. 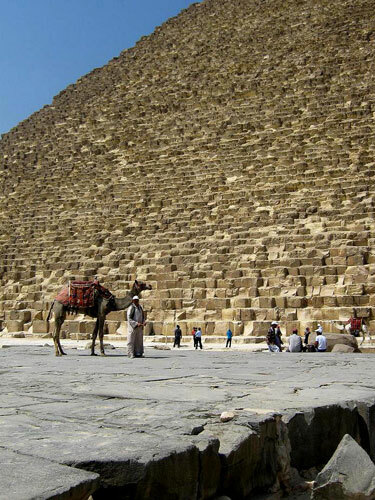 Camel at the foot of the Great Pyramid at Giza. On a more educational note, this exercise will be used to demonstrate how much information has been established by modern Egyptologists about the real processes, technologies and designs used to build the great pyramids of Egypt’s Old Kingdom, from about 2,700 B.C. 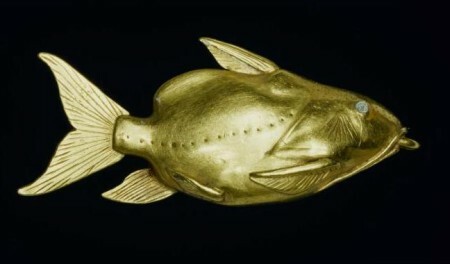 to around 1,800 B.C. 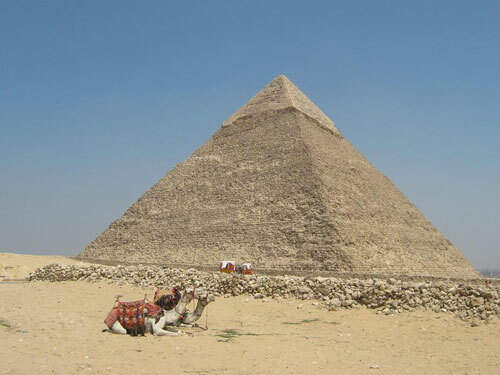 Thanks to the surveys in Egypt and translations of ancient papyruses (recording mathematical equations for calculating the heights and volumes of pyramids), we now know a lot about the construction methods they used. We also know a lot about the rituals and beliefs of the pyramid builders themselves, and about why they built these gigantic monuments. Only the actual methods for lifting the blocks is still a bit of a mystery, but even here there is evidence that levers and sleds were used to slide the blocks up long smooth ramps to the top. None of these sleds have been found, but perhaps it’s because they were made of wood, and wood generally got used for other things once the construction projects were complete, or they may have been broken up and burnt on cold winter nights in the desert. The Pyramid of Khafre at Giza. So if you want to know more, please come along, lend a hand or make an offering to the pharaoh, and take this opportunity to see the brilliant collection of valuable things in the National Museum of Scotland’s Egyptology collection. The Fascinating Mummies promise to be fascinating as well! Join us at Egyptology Scotland for information about future lectures and events in your area. My doesn’t time fly when you’re having fun! It’s been almost two years since I joined the new Digital Media team at National Museums Scotland and time has certainly flown by! It’s been a really exciting creative journey getting acquainted with the collections and fascinating world at the museums. 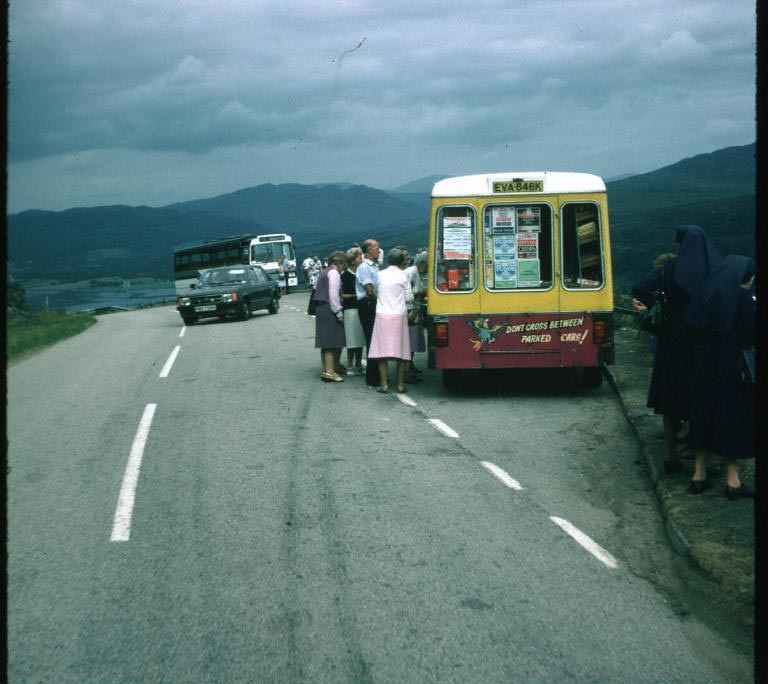 Ice cream van, Bute, September 1983 from the Scottish Life Archive. 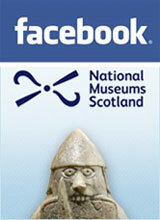 The last year has seen an increase in activity in online activity at the National Museums Scotland, we’ve got a fabulous HTML5 redeveloped website which has experienced significant increase in website traffic (up nearly 30% from this time last year) and we are now firmly established on Twitter, Facebook and Flickr. A great addition to our Flickr photostream has been images from our Scottish Life Archive which have marked the changing seasons and special exhibitions. As Content Creator, the topics that I investigate become ever more varied, and the opening of the redeveloped National Museum of Scotland will only add to my knowledge of peculiar museum facts. Some of the highlights over the last year have been digital detective investigating the mummy coffins from Ancient Egypt, discovering what objects are associated with Mary Queen of Scots and examining the detail in war paintings. I’ve also been doing a bit of digital reporting from events across the sites , notably Concorde’s 35th anniversary, World Wars Experience and Robots Live! 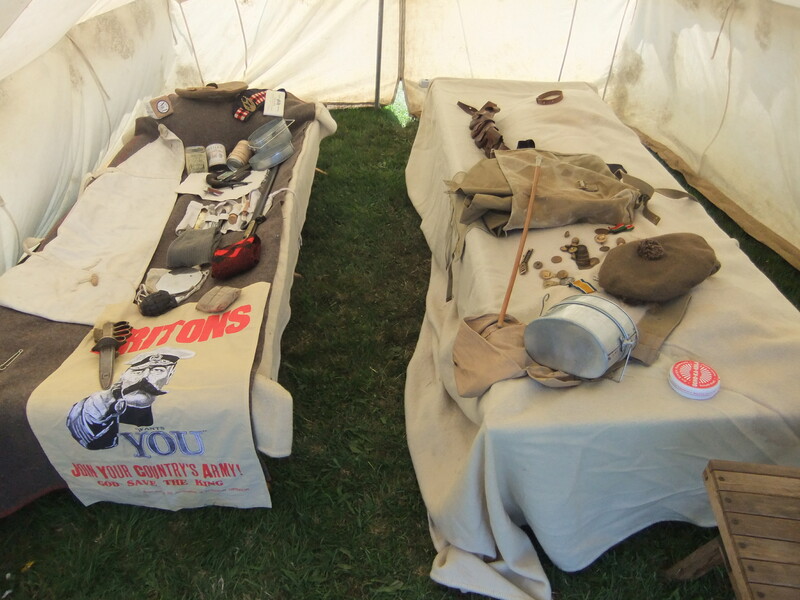 Interior of First World War troop tent at World Wars Experience at National Museum of Flight. We are really excited about the opening of the redeveloped National Museum of Scotland on 29 July. It gives us the opportunity to feature some of the so far unseen objects that await visitors when the museum opens its doors. We will be making the most of our social media channels to let you know what is is happening and what new things there are to see. Why not follow us on Twitter, on Facebook and Flickr to keep-up-to-date with developments? 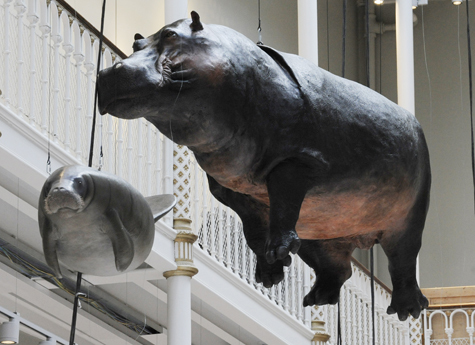 Flying hippo and manatee in the Wildlife Panorama at the National Museum of Scotland. Photo by Sean Bell. Across the museums, our summer events programme is now in full swing and we are looking forward to letting you know what happens pre and post event at this year’s Airshow and our opening weekend at National Museum of Scotland. For the Airshow, guest blog posts are being provided by some of those taking part in the flying display and activity on the ground. 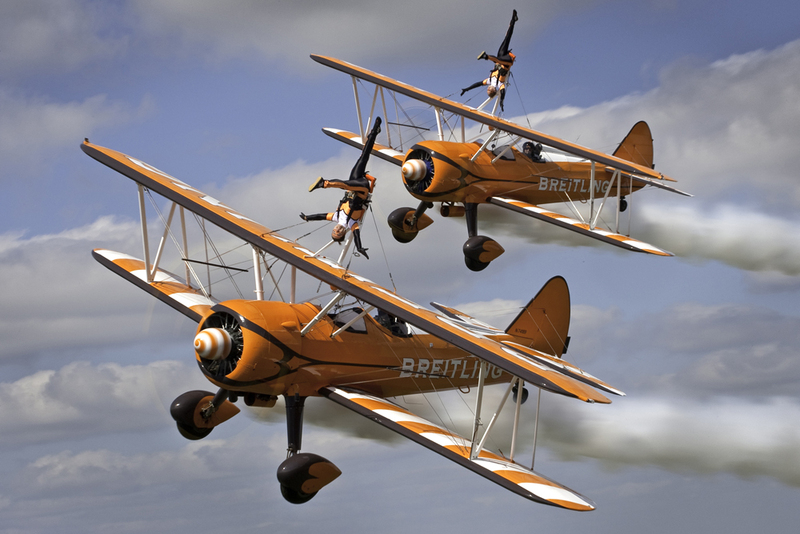 The Breitling Wingwalkers performing an aerobatics display. Well, I think that’s all for now but don’t forget to keep in touch with all that’s going on at National Museums Scotland on our website! We are a Primary 3 class at Haddington Infants School. 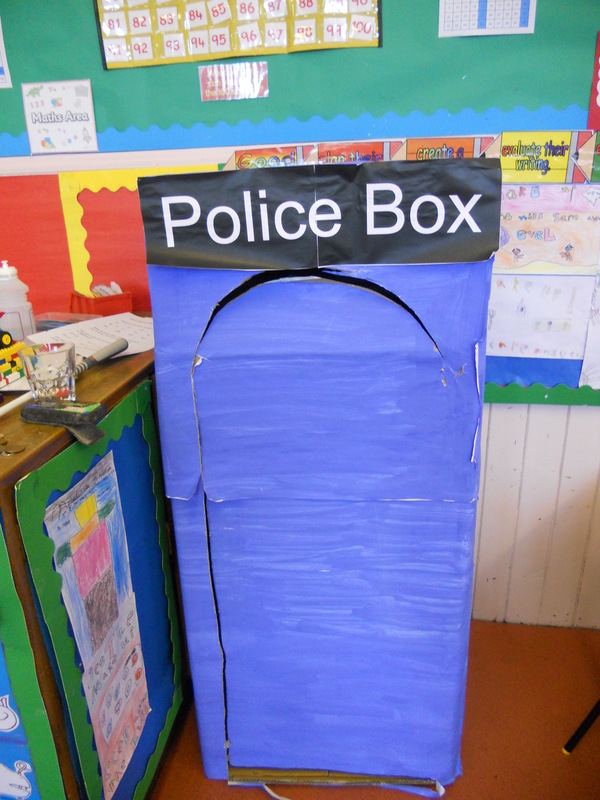 At the beginning of this term a mysterious time traveller called Pasheri visited our classroom and left us a mission. Our mission was to find out about the death of King Tut. 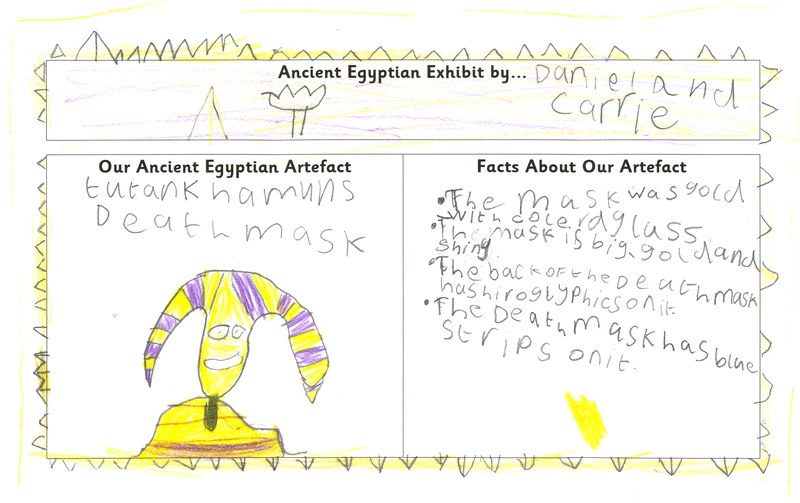 We had to ask our Head Teacher if it was okay for us to change our topic to Ancient Egypt. She told us it was okay. 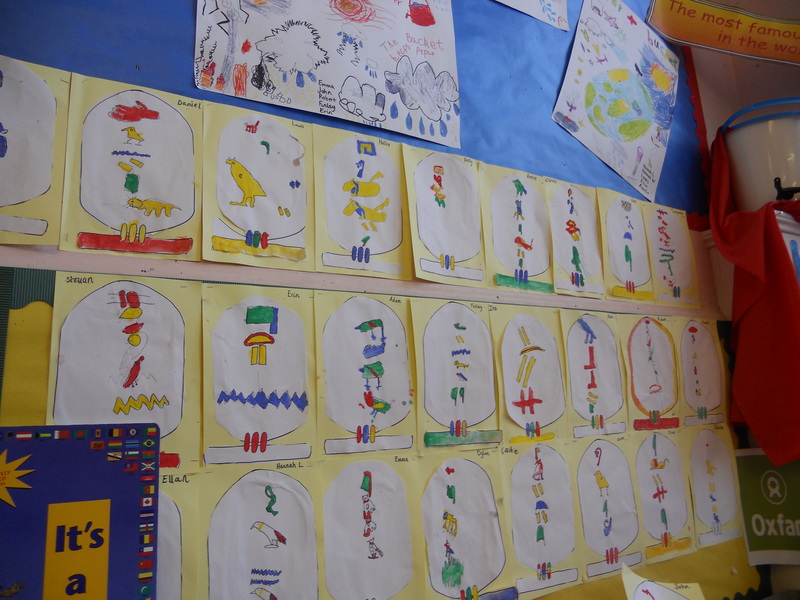 We have been learning lots about Ancient Egypt over the past few weeks and have had great fun too! We have even been to Egyptian school for the day. 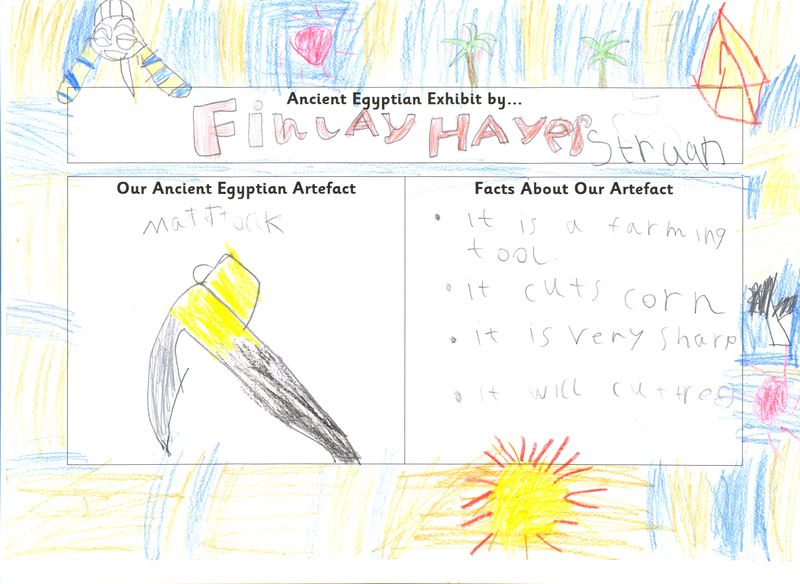 As part of our topic we looked at different Egyptian artefacts and researched them on the computer. After we had carried out our research we all thought about what all our information would be useful for. Our class teacher, Miss Fleming, told us about your museum and that just now its all getting done up. We thought that it would be a good idea if we used all our information to create a Museum Exhibit for the National Museum of Scotland. 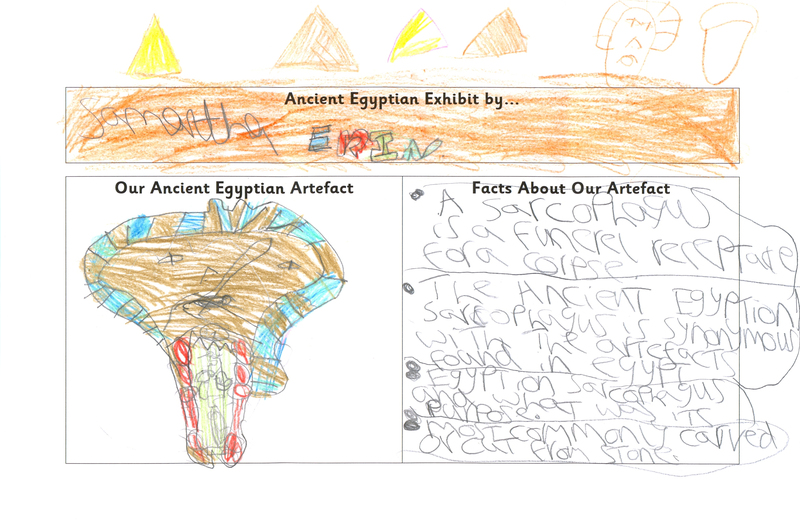 We would love to know what you think of our exhibit and all the work we have been doing in our topic.